Zapier is a platform to connect the apps you use and easily move data between them. AppOptics users can take advantage of Zapier’s webhooks to integrate with over 400 applications and services. Every recipe, or Zaps as they’re called, is comprised of a Trigger and an Action. For example, an AppOptics user might want to receive a direct SMS message for an alert instead of routing through one of our other incident management services like PagerDuty or VictorOps. By routing your alerts through Zapier, you can create a custom delivery pipeline through any of their supported actions. 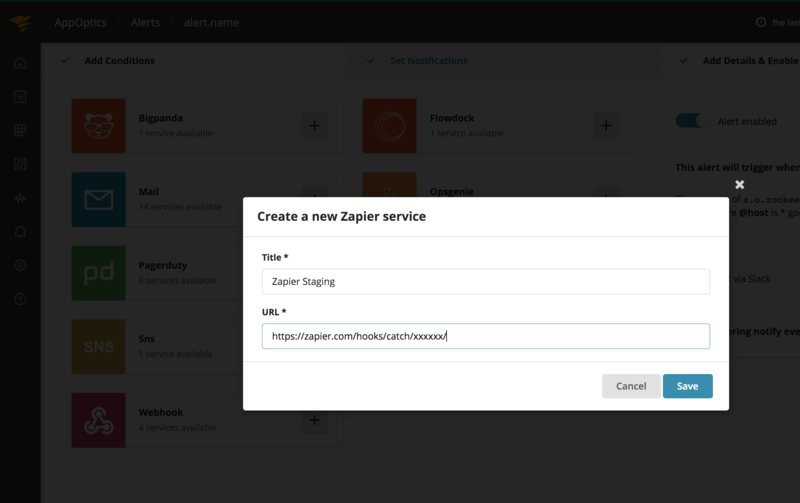 In just a few steps, users can configure a new service integration for the Zapier platform. Let’s take a look at crafting a Zap that delivers AppOptics alerts via SMS. You will be prompted with the following. We will use this URL later on to setup our AppOptics service configuration. You can copy this URL now, but we’ll be presented again with it later on in our process. Click Continue. Select an SMS recipient. If you have not set up an SMS account, it will require verification. Zapier filters allow you to match incoming data against conditions. It is not applicable to AppOptics alerts, so we’ll skip the filter triggers step. To continue, Zapier requires a sample alert from AppOptics. Click on Insert fields to trigger the following modal. Now we can copy the generated URL, then click Ok, I did this to continue. Now that we have the URL we’ll need to jump over to our AppOptics account and setup a new service. For now, keep the Zapier window open so we can come back to confirm the final setup once we’re finished. Log into AppOptics then click on the Alerts tab. If you do not have a AppOptics account, sign-up for a free 14-day trial. Create a new alert, or select an existing one. Next, click the Notification Services tab. Click on Create a new service, then select Zapier from the drop-down. Enter a title for this service and paste the Zapier webhook URL into the url field. Click Save to finish adding the service, and then click on ‘Test Fire Alert’ to send our first sample alert over to Zapier. Jump back to your Zapier window to click ‘Ok, I did this’ to confirm that the sample alert was sent. Finally, match up an AppOptics Alert to an Action. Zapier allows Actions to access data from Triggers. To begin, click Insert fields again. A list of variables from the alert should now be available to customize your SMS message. When you’re finished, click Continue. Finally, give your Zap a unique name and click Turn Zap on to enable it. Now when an alert is triggered, an SMS will be sent via Zapier. This tutorial chose SMS as the Action app, however you can easily send alert data to any Action app on Zapier!